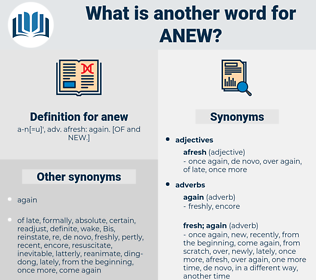 What is another word for anew? day after day/week after week/year after year etc..
nevermore, ne'er, occasionally, periodically, sporadically, little, rarely, infrequently, sometimes, never, unusually, seldom, intermittently. The subdued passion in Annette's voice stirred anew the vague trouble in Aunt Maria's mind. 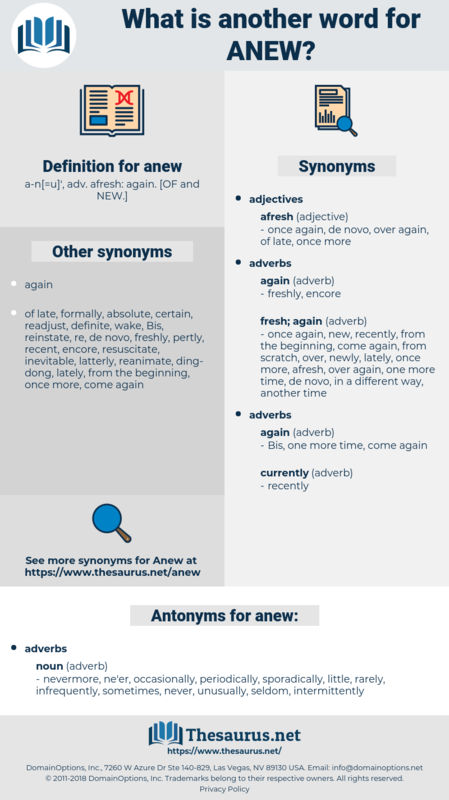 anonym, aeon, amino, aim, amia, amoy, amnio, AMUN, anomie, awn, ain, ammonia, ammonium, annwn, anion, ayin, ane, amenia, annum, ammonium ion, anu, an, anyhow, anaheim, anemia, ammine, annam, a-one, aeonium, AM, anna, ANON, anomia, amnion, Anne, amine, amah, anon., amon, anhima, anima, Aum, anoa, anime, anemone, annona, ammo, ana, any, amman, awny, A'man, annoy, aeonian, ani, Ano, amen, ammino, a.m., anyway, anaemia, Anomy.